It's obvious we love cool posters and slick design work here on FS.net. We feature work from Mondo (like this awesome Dredd poster) and other artists all the time, and there's nothing quite like an amazing piece of film artwork to get you pumped up about a movie. Sometimes the amateur pieces are even better than the official studio posters, as was the case with Battleship earlier this year. But sometimes the studios get ’em right. 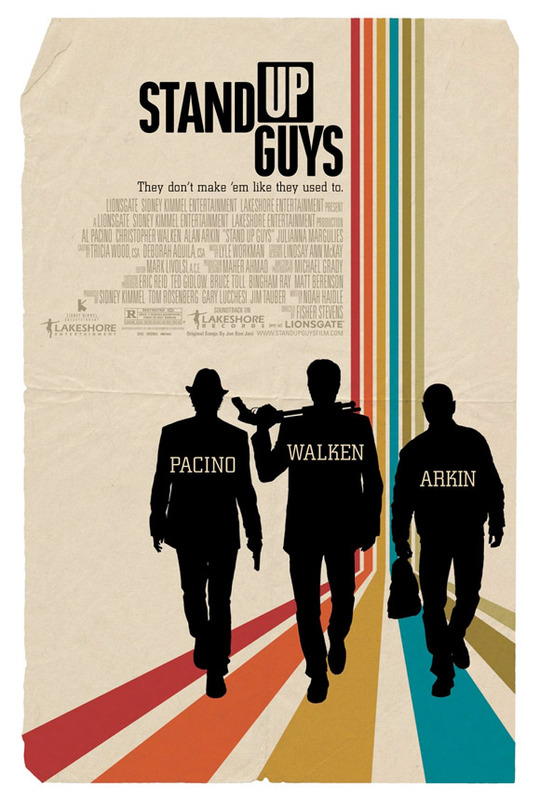 Here's a new official poster (via IMPAwards) for Stand Up Guys, the new hit man comedy starring Christopher Walken, Al Pacino and Alan Arkin, which I actually like more than the film's trailer itself. Fisher Stevens (producer of The Cove) directs Stand Up Guys from a script by Noah Haidle. Val (Al Pacino) is released from prison after serving twenty-eight years for refusing to give up one of his close criminal associates. His best friend Doc (Christopher Walken) is there to pick him up, and the two soon reteam with another old pal, Hirsch (Alan Arkin). But one of the friends is keeping a dangerous secret, and his time to find an acceptable alternative is running out. The film is expected in theaters on January 11th next year, which isn't too promising. We featured the first trailer for this movie just last week if you haven't seen it yet. Dig the 1970s theme. Now just gotta slap some bass. I hear me some James Brown when I look at that poster.